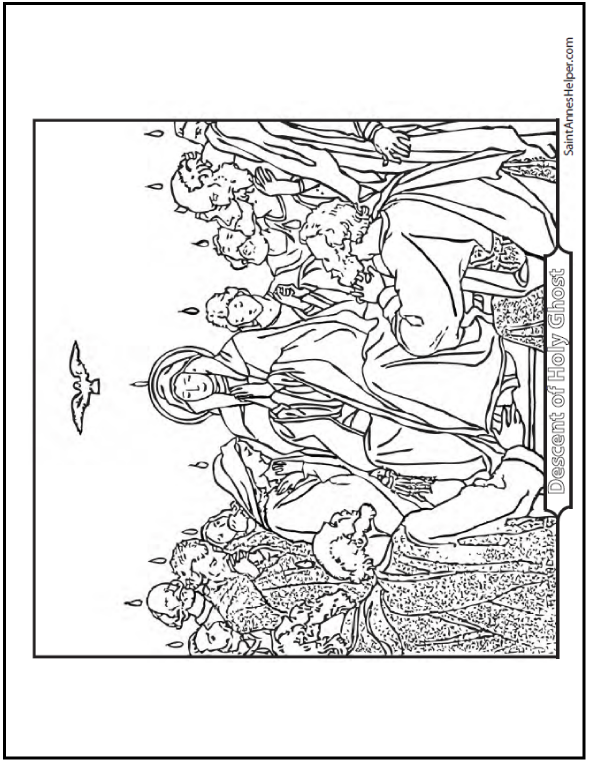 This Pentecost coloring page shows the Holy Ghost in the form of a dove descending on Mary and the Apostles and tongues of fire and other images. Many other disciples were in the Upper Room as well. Great Confirmation symbol, Third Glorious Mystery, and Bible story coloring page for Acts Chapter 2. These PDFs print to 8.5x11" single sided. 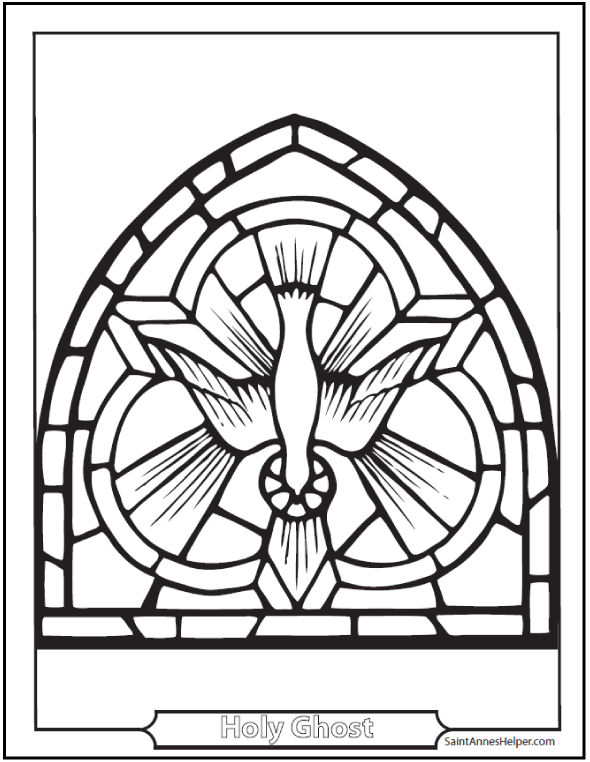 Stained Glass Picture Of The Descent of the Holy Ghost as a Dove. The Holy Spirit descended on Mary and the Apostles as tongues of fire. The Holy Ghost descends on the Apostles and Mary in the form of a dove and tongues of fire. 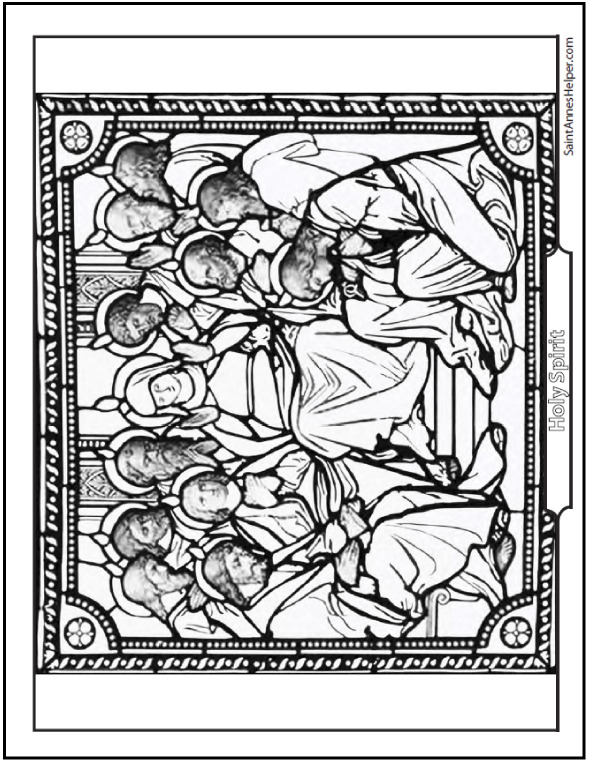 Stained Glass Pentecost Coloring Page Mary and the Apostles on Whitsunday 50 days after Easter. Pentecost Sunday is ten days after Ascension Thursday which is forty days after Easter. It is a movable feast as it's date depends on Easter which depends on the full moon. Pentecost, or Whit Sunday, is when the Holy Ghost descended on the Apostles and Mary. Children love to learn about this extra special victory for Jesus - it's fun to know how He sent the Holy Spirit to comfort His disciples. I like to note that the Apostles stayed close to Mary all that time and that is what we should do when we are grieved or scared. Mary will help us. Pentecost is also a symbol for Confirmation. 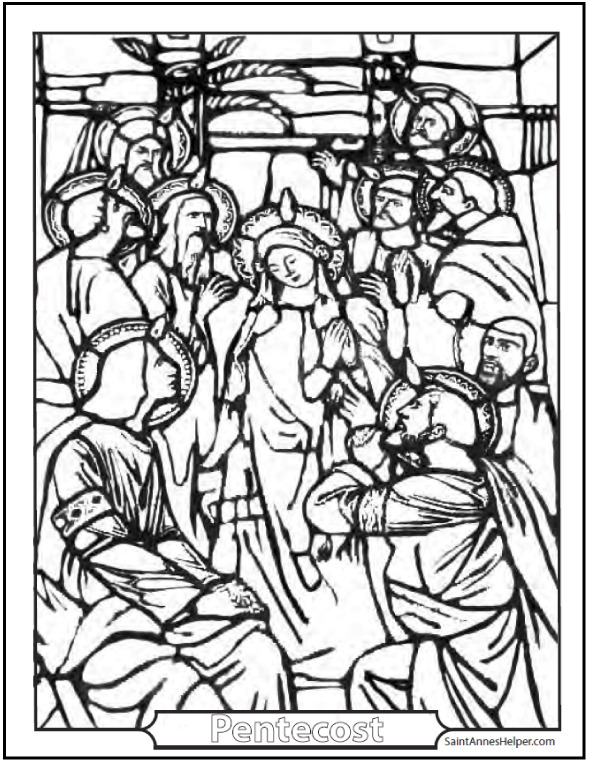 Fifty days after Easter the apostles and disciples of Jesus Christ were assembled in an upper chamber, engaged in prayer, according to the recommendation of the divine Master, and awaiting the accomplishment of the promise He had made to them, of sending them a Comforting Spirit, the Paraclete, Who should teach them all things. Lo! a great noise, as of a rushing tempest, was suddenly heard, the house was rocked to and fro, and tongues of fire were seen resting on the head of each one. At once all were changed into new men, their minds being endowed with full understanding of the Scriptures and of the wonders they had hitherto witnessed without comprehending, and their souls were tilled with strength from on high; thenceforth they belonged no more to themselves, but to the work of the Gospel. From that time forth this divine Spirit has not ceased to pour Himself forth upon the Church to enlighten, confirm, protect, and guide; He has not ceased communicating Himself to each of the faithful individually, either by means of the sacraments or by grace, whenever He has found hearts well disposed. The Fathers of the Church and all theologians are of one mind in recognizing, in the workings of the Holy Ghost in the hearts of the faithful, seven chief gifts: Wisdom, Understanding, Counsel, Fortitude, Knowledge, Piety, and the Fear of the Lord. the gift of the Fear of the Lord turns us aside from sin and from whatever may displease God. Reflection.—" They that are according to the flesh mind the things that are of the flesh; but they that are according to the Spirit mind the things that are of the Spirit. For the wisdom of the flesh is death; but the wisdom of the Spirit is life and peace."